<> at Liberty Stadium on December 13, 2013 in Swansea, Wales. There was a sense of profound disappointment on Monday as news broke that Rhys Patchell faces a four-month lay-off to correct knee and shoulder problems. The precocious Cardiff Blue had been brilliant in the early part of this season, showcasing a vast array of attributes – steadfast confidence, a siege gun right boot and more than enough defensive presence to look after himself in crowded midfields. But while the red-headed 20 year-old gave Warren Gatland a robust nudge and could well have added to the two Test caps he won in Japan over this coming Six Nations, Wales are not short of a fly-half or two. In fact, the fabled factory of number tens is in fine fettle. It’s actually a decent reason to forget the embarrassing WRU-regional rugby arguments, too. Here are a few candidates to take over this spring. Having started the final autumn international against Australia, Dan Biggar is the man in possession. Despite enduring a rather chastening time that afternoon opposite red-hot Quade Cooper (picking up a yellow card in the process), he is obviously trusted by Gatland – and with good reason. Biggar’s goalkicking this term has been superb. A speculator from 55 metres on Boxing Day halted a run of 35 consecutive successes from the tee, while his distribution is also looking crisp. Assured displays over the imminent Heineken Cup fortnight will probably see him face Italy on February 1. The past 18 months can’t have been easy for Rhys Priestland, but it seems he has managed to emerge from a horrible period dogged by on-field indecision, self-doubt and awful injuries. That said, the 26 year-old remains an enigma. Two lively Scarlet performances in the festive derby clashes with the Ospreys demonstrated how incisive and dangerous his running can be. But when he wavers off wavelength, it’s hard to forget – see an odd grubber to end Wales’ attempt to overhaul Australia. Gatland’s decision to hand James Hook an audition against Tonga in November represented something of an olive branch. Sadly, the Perpignan pivot could not quite grasp the gilt-edged chance and overplayed his considerably skillful hand in a terribly turgid game. Now 28, you feel Hook is at something of a crossroads – either Gatland entrusts his experience with a pivotal role in the lead-up to 2015, or other avenues are pursued. As canny as coaches come, Lyn Jones is one to choose his lieutenants wisely. With that in mind, Jason Tovey’s unfussy prominence during the Dragons’ odds-defying Pro12 to date has been a big endorsement. Still 24, he is a graceful game-manager who punches well above his 85-kilogram frame in defence – in fact, his low chop-tackling allows back-rowers to swarm rucks and plunder turnovers. Tovey was also cheeky enough to admit how much pleasure he took from proving a point with a 17-point haul to overturn former employers Cardiff Blues ten days ago. There’s a lot to like about that. And so to the left-field options. Becoming the second Welshman to win the IRB Young Player of the Year award – behind a certain Gavin Henson in 2001 – Sam Davies has earned himself a burgeoning reputation. Rather than stall, he thankfully seems set on enhancing his standing. Gatland is unlikely to promote the prodigious Osprey on the back of a few outings at full-back, though. Even so, as a bloke ballsy enough to manufacture a 79th-minute try in a Junior World Championship semi-final with a deft chip before nailing the touchline conversion for a one-point win, Davies won’t have to wait too long for further progress. If you want to learn, there’s not much point reclining in a comfort zone. Trading West Wales and a Scarlets bench spot for the East Midlands this summer, Owen Williams endeavoured to improve. It might seem slightly odd to label a move to the Aviva Premiership champions Leicester Tigers as a calculated gamble, but with Toby Flood and Ryan Lamb ahead of him in Richard Cockerill’s pecking order, that’s what it was. If he were to look back now, he can feel very content. Williams has usurped Lamb and treated Welford Road to some exceptional play – a virtuoso showing against Sale the stand-out so far. Blips such as Sunday’s missed conversion to beat Bath are merely part of the education. From the way he fizzes passes from the gainline, his class is evident. Gatland must have noted that. Matthew Morgan is yet to turn 22, but it seems he has been the next big thing in Welsh rugby for half a decade already. Explosive acceleration and a nose for the line definitely single him out as a phenomenal talent – a stunning 90-metre try in Ospreys’ thrashing of Edinburgh and the lacerating break that led to Justin Tipuric’s score against the Dragons just two examples of his electric tendencies. Unfortunately, having fallen out of favour at the Liberty Stadium, a full international is a while off. 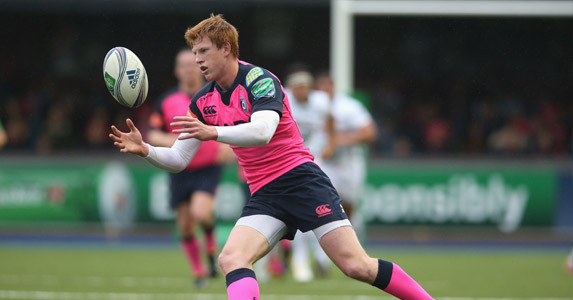 With Patchell now out, it would fantastic to see the Blues give him a shop window with some sort of loan agreement. A diminutive magician, Morgan simply cannot be allowed to stagnate.